Welcome To Your City Escape! Located Not Too Far From Downtown Victoria You Will Find Our Newly Renovated One Bedroom And One Bathroom Garden Suite. This Beautiful Quiet Suite Has A Private Entrance And Private Garden Patio For You To Enjoy! The Suite Is Fully Furnished And Is Located On A Beautiful Tree Lined Street. Relax On Your Own Private Patio While Enjoying Your Morning Cup Of Coffee And Listening To The Birds Signing. The Yard Is Landscaped With Flowering Shrubs And Accented With Many Annual Flowers. We Would Love To Have You Stay With Us So That You Too Can Enjoy The Peaceful Beauty And Comfort That Our Garden Suite Has To Offer! My Husband and I have lived in Victoria for the past 30 years and love our city! We have raised our two beautiful children here and now have the joy of babysitting our two grandchildren. We would love to have guests come and experience the city we call home and to enjoy the many sights that has made Victoria one of the most popular cities to visit in the Province of British Columbia. Please come join us and let us have an opportunity to have you as our guests! We purchased our home because the location was perfect... located in a prestigious neighbourhood that is both quite and safe. We decided to share our home by fully renovating our garden suite and renting it out to travellers to enjoy. The location is very convenient as it is located close to to Grocery Stores, Bus Stops, Restaurants, Parks etc. 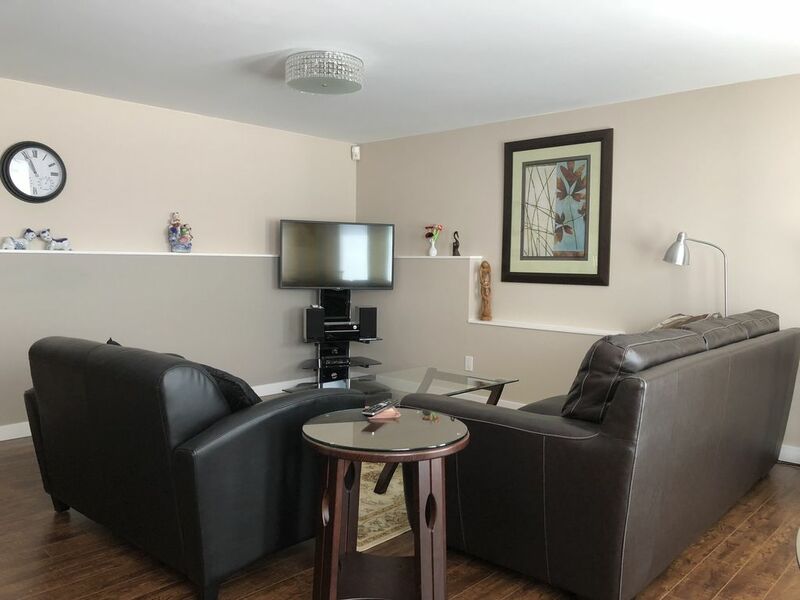 Some Of The Unique Benefits Is The Location As The Unit Is Located Very Close To Many Parks And Hiking Trails To Enjoy A Quiet And Peaceful Walk. Salt, Pepper, Oil, Basic Spices Etc. We stayed 4 weeks in this well keep, clean Garden Suite. Easily accessible,well stocked,linens and towels good quality. Close to anywhere we wanted to go and we went every day to many places: beaches, Beaver /Elk lakes ,Esquimalt Lagoon, Gordon Head/Metchosin to name a few. The shopping areas were close and lots of them Inner City Harbor Close, Butchart Gardens 15 minutes away and much much more . We had a vehicle so that helped. Lucy and Kempton were sociable and available when we needed them which wasn't often. Everything one needs for a great visit in Victoria. Enjoyed our stay. Very comfortable suite. Close to walking trails in a quiet neighbourhood. Close to mall with restaurants, grocery store, pharmacy, etc. Lucy and Kempton are fabulous hosts; wonderful welcome and and Orientation to suite. Would love to stay here again. AAA+.The apartment was immaculate and very spacious. Lucy and Kempton were very gracious host. They made our stay in Victoria special. Will stay with them if we go back to enjoy beautiful Vancouver Island. Thank-you very much for your review, we are glad you enjoy your stay with us. Very nice place to stay with very nice owners. The perfect distance from Victoria. Lucy and Kempton are delightful folks and wonderfully thoughtful hosts. They have thought of everything to make your stay comfortable if you are staying 2 days, 2 weeks, or 2 months. Their Garden Suite is beautifully appointed and convenient to everything. Needless to say we were well pleased with our stay with Lucy and Kempton and would highly recommend renting with them. Everything was perfect . We have stayed in 5 different VRBO properties in Victoria and this was the best . The location is beautiful and quite, and Lucy is a great host .